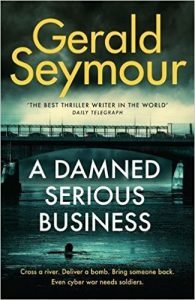 A Damned Serious Business, the new novel by Gerald Seymour, is published in the UK today in hardback. Bargain hunters may want to check out Amazon UK where the hardback is currently priced at just £5.99. The price will probably go up so grab it quickly. 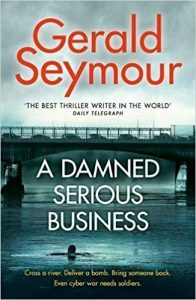 My review page for the new novel A Damned Serious Business Has now been added to the site. The book is published in hardcover on 4 January 2018. Just a quick alert that the new paperback edition of Jericho’s War is officially published by Hodder books on Thursday 30 November 2017. That will be followed in January by the new hardback, A Damned Serious Business. I’ve finished reading my advance copy and a review will be up soon(ish). Finally thanks to Sue for letting me know that Gerald will be talking about, signing and selling his latest book in a little Welsh library on 31 January. Details on Friends of Rhydypennau Library Events Facebook page. 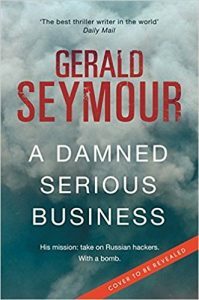 A look at Amazon UK today revealed the title and blurb of the next Gerald Seymour novel. A Damned Serious Business is out in hardback on 4 January 2018. As always this far out it’s possible that the title and indeed the release date will change.